Take a break from the city and head to Jumeirah Public Beach and Marina Beach. Spend the 23rd (Thu) spotting exotic species with a safari tour. There's lots more to do: buy something for everyone on your list at The Dubai Mall, enjoy the sand and surf at Umm Suqeim Beach, enjoy breathtaking views from Burj Khalifa, and get engrossed in the history at Al Fahidi Fort. Ask Inspirock to suggest an itinerary and make planning a trip to Dubai fast, fun, and easy. Goiania, Brazil to Dubai is an approximately 21.5-hour flight. Traveling from Goiania to Dubai, you'll lose 7 hours due to the time zone difference. In April, Dubai is somewhat warmer than Goiania - with highs of 39°C and lows of 28°C. Wrap up your sightseeing on the 24th (Fri) to allow time to travel to Sharm El Sheikh. Start off your visit on the 25th (Sat): discover the deep blue sea with a scuba or snorkeling tour. Here are some ideas for day two: take a stroll through Na'ama Bay, then get outside with SOHO Tennis & Squash center, and then enjoy the sand and surf at Ras Um Sid. To see photos, where to stay, traveler tips, and other tourist information, read Sharm El Sheikh driving holiday planner. Traveling by flight from Dubai to Sharm El Sheikh takes 5.5 hours. Alternatively, you can do a combination of shuttle and flight; or drive. The time zone changes from Gulf Standard Time (GST) to Eastern European Time (EET), which is usually a -2 hour difference. While traveling from Dubai, expect a bit cooler days and about the same nights in Sharm El Sheikh, ranging from highs of 36°C to lows of 25°C. Finish your sightseeing early on the 26th (Sun) so you can travel to Cairo. 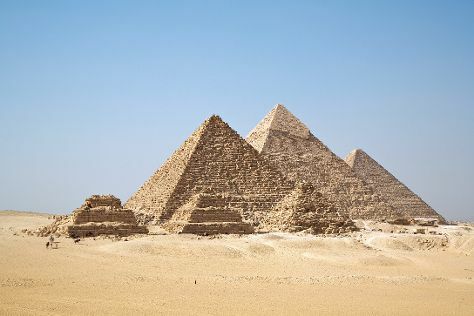 Satisfy your inner culture vulture at Islamic Cairo and Pyramids of Giza. When in Cairo, make a side trip to see Great Sphinx in Giza, approximately 34 minutes away. And it doesn't end there: take a stroll through Old City (Coptic Cairo), contemplate in the serene atmosphere at Mohamed Ali Mosque, admire the striking features of Hanging Church (El Muallaqa, Sitt Mariam, St Mary), and see the interesting displays at Egyptian Antiquities Museum. For ratings, traveler tips, maps, and tourist information, read Cairo trip itinerary maker website . Getting from Sharm El Sheikh to Cairo by flight takes about 2 hours. Other options: take a bus; or drive. Expect little chillier evenings in Cairo when traveling from Sharm El Sheikh in April, with lows around 19°C. Cap off your sightseeing on the 29th (Wed) early enough to travel to Goreme. 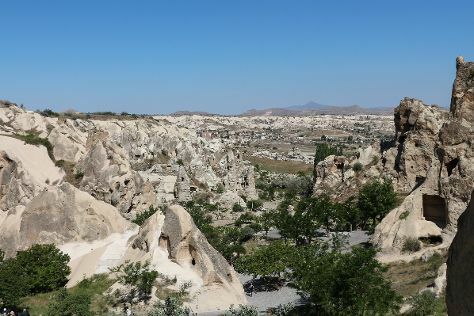 Get outdoors at Goreme National Park and Balloon Rides. Get some cultural insight at Cappadocia Cave Dwellings and Naile Art Gallery- Ebru Art Center. Go for a jaunt from Goreme to Derinkuyu to see Derinkuyu Yeralti Sehri about 38 minutes away. Next up on the itinerary: ride a horse along Cemal Ranch Horse Riding Center and take an in-depth tour of Goreme Acikhava Muzesi. To see traveler tips, other places to visit, maps, and tourist information, you can read our Goreme trip itinerary planning app . Traveling by flight from Cairo to Goreme takes 7 hours. Alternatively, you can do a combination of flight and bus; or drive. The time zone difference moving from Eastern European Time to Eastern European Time is 1 hour. Traveling from Cairo in April, expect nights in Goreme to be colder, around 5°C, while days are little chillier, around 22°C. Finish your sightseeing early on the 2nd (Sat) so you can travel to Istanbul. Appreciate the collections at Topkapi Palace and Kariye Museum (The Chora Church). For shopping fun, head to Kapali Carsi or Istiklal Street. And it doesn't end there: explore the galleries of Hagia Sophia Museum / Church (Ayasofya), contemplate in the serene atmosphere at Suleymaniye Cami , contemplate the long history of Basilica Cistern, and explore the world behind art at Istanbul Modern Museum. To find maps, photos, traveler tips, and more tourist information, you can read our Istanbul trip itinerary website . Fly from Goreme to Istanbul in 4 hours. Alternatively, you can do a combination of flight and shuttle; or drive. Plan for somewhat warmer nights when traveling from Goreme in May since evenings lows in Istanbul dip to 15°C. 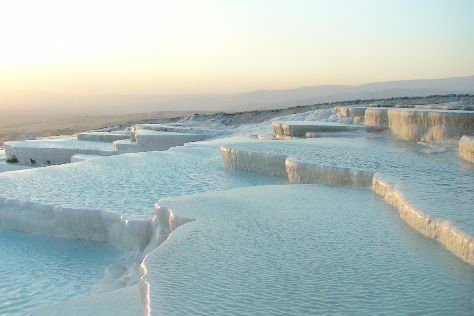 Wrap up your sightseeing on the 6th (Wed) early enough to travel to Pamukkale. Kick off your visit on the 7th (Thu): explore the fascinating underground world of Kaklik Cave, then head outdoors with Pamukkale Balloons, and then explore the activities along Cleopatra Pools. Here are some ideas for day two: cruise along Road to Pamukkale, then take in the natural beauty of Pamukkale Thermal Pools, and then contemplate the long history of Hierapolis & Pamukkale. To see ratings, traveler tips, photos, and more tourist information, read our Pamukkale journey planner . Traveling by combination of flight and taxi from Istanbul to Pamukkale takes 4.5 hours. Alternatively, you can do a combination of shuttle, flight, and taxi; or drive. Cap off your sightseeing on the 8th (Fri) early enough to go by car to Selcuk. Maket Koy and Ephesus Museum will appeal to museum buffs. Your cultural itinerary includes sights like Ancient City of Ephesus and The Basilica of Saint John. There's much more to do: delve into the distant past at Bibliotheque de Celsus, see the interesting displays at TCDD Tren Muzesi, contemplate the long history of Public Latrine, and enjoy the sand and surf at Pamucak Beach. For ratings, reviews, more things to do, and other tourist information, read Selcuk online day trip planner . Traveling by car from Pamukkale to Selcuk takes 3 hours. Alternatively, you can take a train; or take a bus. May in Selcuk sees daily highs of 30°C and lows of 15°C at night. Wrap up your sightseeing on the 11th (Mon) early enough to travel to Grecia. Grecia is the capital city of the canton of Grecia in the province of Alajuela in Costa Rica. Get in touch with nature at La Paz Waterfall Gardens and Los Chorros Waterfalls. 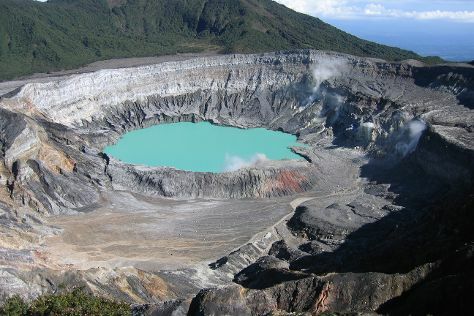 Explore Grecia's surroundings by going to Poas Volcano (in Poas Volcano National Park) and El Toledo Coffee Tour (in Atenas). There's more to do: appreciate the views at Orosi River Valley ( El Valle del Rio Orosi ) and take a peaceful walk through Reserva Forestal Grecia Sector Bosque del Nino. To find ratings, traveler tips, and tourist information, you can read our Grecia road trip site . The Route module can help you plan travel from Selcuk to Grecia. The time zone difference moving from Eastern European Time to Central Standard Time is minus 9 hours. Traveling from Selcuk in May, you can expect nighttime temperatures to be somewhat warmer in Grecia, with lows of 22°C. Finish up your sightseeing early on the 14th (Thu) so you can travel back home.